The Gason spreader specialises in accurately spreading a variety of materials from urea to chicken litter. The underslung spinners, under floor return system and wider door opening also allows for an unobstructed feed and a capacity to spread almost any product. With few moving parts maintenance requirements are kept to a minimum. The uniquely shaped spinner discs work together to provide a accurate, controlled and even spreading. The twin spinners are hydraulically driven by high torque motors. There is also a digital tachometer which shows the accurate monitoring of spinner speeds. The speed can also be altered at either the tractor or the spreader. The spreader has a ‘set and forget’ system that sets the rate according to the operator manual and drive according to conditions on the ground. With a three spread gearbox, a wide range of options are available for spreading. The chain feed system maintains an even flow to the spinners and the low side walls of the spreader allow for easy loading. 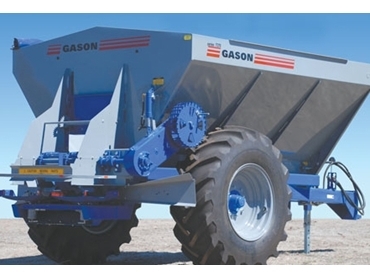 With high flotation tyres compaction is reduced which makes the Gason Spreader the ideal choice for high tonnage applications.